Bill Evans and Lianne Furlong, Aviva Trial Lawyers. Insurance companies and other legal departments are beefing up their in-house litigation teams with an eye to gaining greater control in defending matters and pursuing issues proactively on behalf of the organizations they represent. The evolution of in-house legal departments is increasingly including the addition of more litigators to the mix, and more companies are looking to hire lawyers who not only have strong file experience but who are also keen to robe up and go to court. Canadian insurance companies in particular, such as Aviva Canada, are also building stronger teams in large numbers. In the last two years, Aviva has rebranded and grown its internal litigation team to more than 80 lawyers. Companies such as Telus, BMO and some public sector organizations have been focused for some time on strengthening how their internal litigation teams manage files with external counsel. While Telus still uses significant external counsel to manage its litigation portfolio, it has been working with its outside partners to develop a more streamlined approach. Desharnais’ team will conduct the discoveries and bring the file ready for trial and outsource the trial because it has a lean litigation team. “We have reduced our external spend by trying to get added value services from external counsel through the way we split the work,” she says. At BMO Financial Group, there are more than 20 members in the litigation practice group including litigators and e-discovery specialists. There are three to five litigators per team. “To me, what’s extraordinary isn’t in terms of a shift or change in number of litigators but more in how we have evolved and innovated and pushed our external partners to do the same,” says Charlene Yaneza, associate general counsel, Global Litigations, Capital Markets Legal at BMO Financial Group, who is based in Chicago but handles a global portfolio. “We don’t sit still; innovation is a priority to do things better and more efficiently. When class actions or other significant litigation arise, the bank seeks advice from external counsel, but it is always looking at ways to internalize some of that work. The rise of in-house litigation departments within the insurance industry has dramatically changed the legal landscape in Canada. Where once insurance companies hired one or two lawyers to manage outside counsel, now insurers are developing sophisticated litigation groups and running trials on a regular basis. The team has eight offices across the country working for commercial and individual clients of Aviva Canada in Toronto, Hamilton, Edmonton, Vancouver, Calgary, Dartmouth and St. John’s. At first glance, one might easily mistake Aviva Trial Lawyers — the newly branded name for the company’s Canadian litigation team — for an external law firm. The team has its own marketing materials and is working on a website to showcase its lawyers. All total the group includes 170 people including law clerks, assistants and an operations team. The operations team that manages the group nationally sits in Toronto at First Canadian Place. Previously, the litigation lawyers were for 10 years located at Yonge and Eglinton. All of that has changed. Furlong reports to the chief claims officer on the executive and oversees all claims. The work comes from the casualty line of business and through a litigation management group. Most of the cases the litigation team handles are personal injury related. If you are an Aviva policyholder and you rear-end someone in a car accident and get sued by that person, Furlong’s group steps in to defend you. The trials the team has done are either motor vehicle or slip-and-fall types of injuries. Aviva Trial Lawyers has six practice groups and each practice group has different levels of lawyers. At the top is senior practice counsel Bill Evans. Each of the six practice counsel are like the partners of Aviva Trial Lawyers. Furlong fills the role of the managing partner. The company has corporate counsel separate from the litigation group. The senior practice counsel assigns files, oversees the work and oversees the trials and mentorship and the national managing counsel is there for the people issues to make sure there is consistency across the practice groups. On the leadership team is a quality control lawyer and her title is matter management counsel. “We have quality checks going on constantly and it’s not so much about did you do something in a certain amount of time but more to the ‘art of lawyering’ — making sure the lawyers are being strategic and that they are getting the right result on files,” says Furlong. Evans started with Aviva 18 years ago when there were just six lawyers at the company. About three years ago, it took the biggest leap forward, not just in terms of the number of lawyers but in setting up the practice groups and the management team and it became more structured in order to grow in the future. It’s a much different organization than it was in 2015 when every lawyer at Aviva reported to the one senior person. At the end of 2015, Furlong started looking for lawyers with trial capability. “We call it our transformation year. We built the operating model, looked at the talent we had, measured it against the operating model, made sure we had the right talent and then did massive amounts of recruiting and hiring,” she says. In 2016, Furlong hired 35 new lawyers. “We built this new unique structure that I don’t think anyone has ever seen before, especially in the insurance defence industry,” she says. Computer software tracks in real time what the lawyers are doing and at what stage the files are — all toward helping to manage files better and show greater value for the company. “We sensed that we were saving the company money, but we weren’t able to prove it empirically. Now we can and we’re really able to show and regularly report how much money we’re saving them by handling the files in-house,” says Evans. Last year, Vanessa Tanner, one of Aviva Trial Lawyers’ senior counsel, did three trials in a 12-month period — two back to back. She worked 16 hours a day and moved up to North Bay to do it. “She took a young lawyer with her and put teeth to the name of Aviva Trial Lawyers. She won it and Aviva gave her a ‘living legend’ award,” says Furlong. Tanner won that case, it was appealed and, in February, the company also won the appeal of that case. “I’ve done a lot of reflection on different types of benefits we provide and they go beyond money because we have a partnership with the company and there are things we do that our external lawyers are not provided the opportunity to do because we’re inside the doors,” she says. At the end of January, Aviva was in the news when it lost a case in which it had taken that position, but it was not defended by the Aviva Trial Lawyers team, it was handled by an external partner law firm. The case arose in February 2009, when the car Maria Persampieri, 84, was in was rear-ended. Persampieri initially sued for $1 million. In response, Aviva Canada said it would not pay her any damages. It went to court and Aviva was ordered to pay $237,000 to cover the legal costs she incurred in winning a $20,000 settlement. “The Ontario legislation states that a plaintiff has to have a serious and permanent impairment in order to recover damages for pain and suffering in a lawsuit like this, so after reviewing the case — and we review each case on the facts — the position we took was we didn’t think the plaintiff was going to meet that definition,” says Furlong. Evans had run trials when it was Aviva Legal services, but in the year and a half before the beginning of Aviva Trial Lawyers, there hadn’t been too many trials managed in-house. A big foundation of the operating model was Furlong’s experience in private practice. She learned and was mentored for six years at Regan Desjardins LLP. Building the litigation team is part of Aviva’s push to address differently the litigation that comes through the door. “We don’t want to be accused of just being lawyers who write cheques and settle cases; we want to demonstrate the ultimate skill of a lawyer, which is to go into a courtroom and conduct a trial and have a good result. That has been the knock on in-house over the years: Can they go that final step? We’ve been proving the capability of doing that,” says Furlong. Evans and Furlong refer to the environment as a “luxurious place to practise law” because lawyers don’t have to worry about how much time they put into a file. She says companies want to watch what they are spending on lawyers and have good external counsel and get the right result, but sending two lawyers on a trial is just not affordable, while it is for the internal team. For every trial Aviva Trial Lawyers does, there is a lead counsel and a second chair. What has the evolution of the litigation team done to its relationship with outside counsel? “The reality is that it is less work for them, but there are files that need their expertise that we cannot handle; we may not have that area of expertise. There is always a place for them, so while there may be [fewer] firms handling Aviva’s work, I think the relationships with those firms are still really strong,” she says. Right now, the accident benefits group does about 50 per cent of Aviva’s litigation and 36 per cent of the tort work in 2017. “Aviva is a big company and there is lots of work. Everyone is best served if the head of Aviva Trial Lawyers is working hand in hand with the head of our law firms that we choose to have on our list and hand in hand with the head of claims,” she says. The rest of the company also leverages the knowledge of the department. “Our GTA West group sits as ‘duty counsel’ once a week — one of the lawyers goes and sits with the claims people and is there to answer questions. We do presentations to brokers about risk avoidance such as how your documents end up in litigation,” she says. In next six months, Aviva Trial Lawyers has 49 files on the trial list and, in Toronto, all of the trials have been put on the June trial list. She also plans on 2018 being the year the department’s data demonstrates just how effective the litigation team has become since being formalized as Aviva Trial Lawyers. Evans recalls when he first started working in-house at Royal Sun Alliance in 1999 and insurers were just starting to hire lawyers in what was largely a claims examining function. In the past, most of the litigation was handed to external counsel. For some time, Leola Pon has quietly wished she had the ability to proactively litigate more files in-house at the Toronto District School Board. Last year, the right litigator walked through her door to make it happen. In what could be a landmark case, the school board is going after a provincial regulation that prevents it from collecting millions in educational development charges to buy land for new schools where there is a growing population of students. The board filed an application in the Ontario Superior Court of Justice at the end of February for a judicial review, arguing the regulation be declared “constitutionally inoperative.” The regulation says boards of education with available school space can’t qualify to the money developers pay when they build new residential housing. “Our former associate director Carla Kisko [now retired] was always thinking about EDCs and why we can’t access them,” says Leola Pon, general counsel at the TDSB. “It was always one of those things we could never get and too big of an issue for us to even challenge it. We never really had the thrust to take it one step further,” she says. 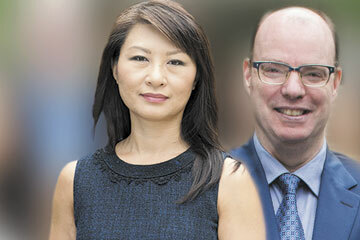 But when Pon was looking to fill some vacancies in her team recently, she converted one spot to a senior litigation counsel and was intending to hire a labour and employment lawyer when she interviewed Patrick Cotter, who was looking to leave private practice after a long career as a civil litigator. Cotter started his career at litigation boutique Genest Murray LLP, which eventually merged with Heenan Blaikie LLP, where he was for six years, then moved to Sim Ashton & McKay LLP Hughes for 10 years. He went to the TDSB in March of last year. “Initially, the job was offered to someone who was a labour and employment litigator, but Pat did such an amazing job in his interview and I realized he could do civil litigation and labour arbitrations,” she says. let’s make use of his litigation skills,” she says. Cotter says going in-house has given him the opportunity to do interesting work without worrying constantly about getting to the next file. “What was great about coming in-house is the freedom to do something interesting, creative and [that] will have [a] huge impact — we’re talking $300 million to $400 million over the next 15 years over the life of the bylaw if it keeps getting renewed and could easily be a billion-dollar issue,” he says. The flipside of it is that, in a case like this, Pon and Cotter don’t have to address why they are spending potentially hundreds of thousands of dollars on legal fees challenging the province. The board always saw it as a political fight and one it didn’t want to appear to be spending taxpayer dollars attacking. In taking on the case, the TDSB is effectively acting as representative of all the school boards in Ontario on the issue. Right now, only 27 of 71 boards are collecting EDCs. Even of the 27 collecting, most would not re-qualify based on the regulation that exists. “We don’t want to be seen to be using public money to essentially be going against the government. This helps when some people may question why we are spending the time and money on this, but at the same time, it means so much. It’s something the school board has been wanting to fight but never got past a certain point,” says Pon.